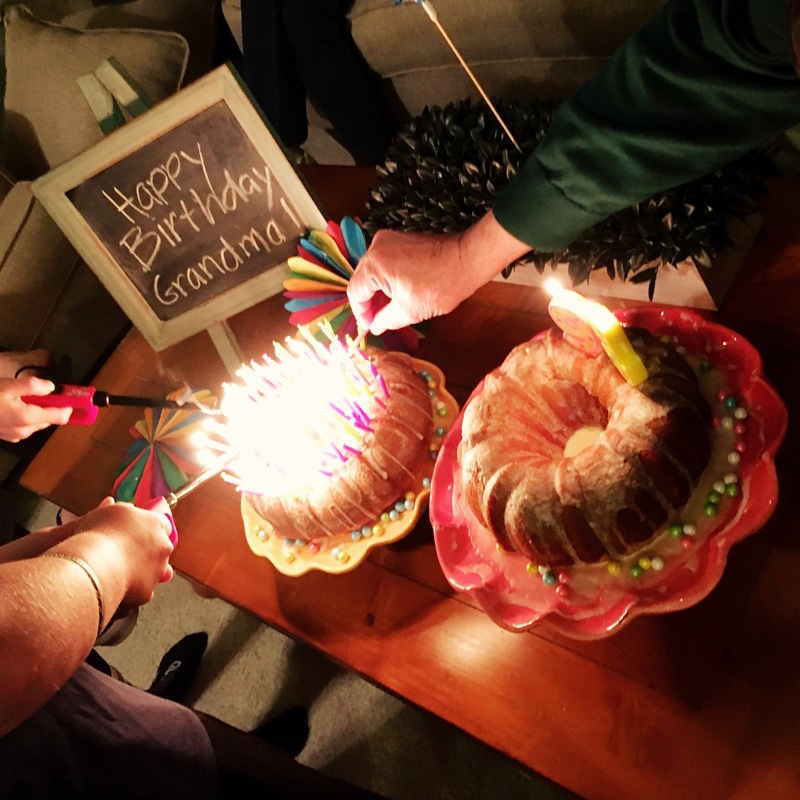 I was so excited to see #HappyBirthdayGrandma was an existing hashtag on both Facebook and Instagram when I had occasion to use it this week. People are posting about their grandmas’ happy birthdays! What a great use of social media, right? My Grandma turned 91 years old this week. She had three days of celebrations, as the family gathered to have cake on birthday-eve, before I took her for birthday lunch and a special outing at her request on her actual birthday. Then the day after was our weekly #GrandmaDay, so she came for lunch and we sang happy birthday again and polished off the birthday cake together. My sweet Grandma. Grandma is a caretaker. 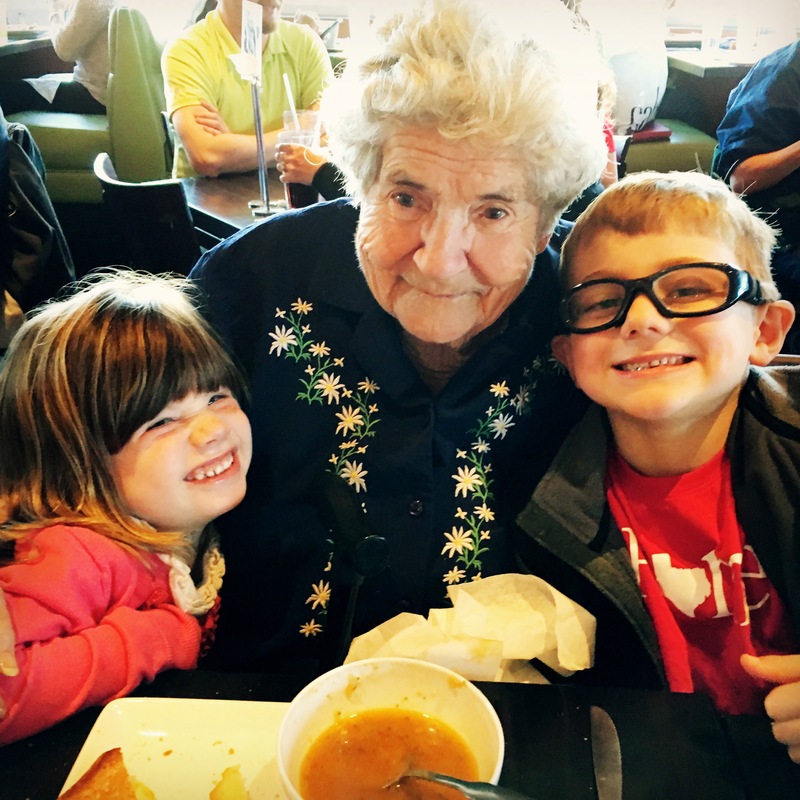 Grandma has spent her life taking care of her husband, her children, her grandchildren, and now even her great-grandchildren. In her younger years she worked as a lunch lady at the elementary school down the street and served in the Primary at church, caring for the children of her neighborhood and congregation. She had a way with numbers, and in her time she knew the birthdays of every one of the 50 or so kids she served at church. When Grandpa’s health started to fail, she cared for him, too. And now, because she cared for us, we care for her. As she has gotten older and lost her beloved husband, her heart has turned to things not of this world. I would even say she is looking forward to returning “home” and reuniting with Grandpa, and with her 10 brothers and sisters, with parents and grandparents, all of whom have passed on. Her heart has always been turned to those who came before her. She has told us family history stories since before I knew who or what she was talking about. The names and stories of her parents and grandparents and great-grandparents were written on my heart during the elementary school summers I spent with her. 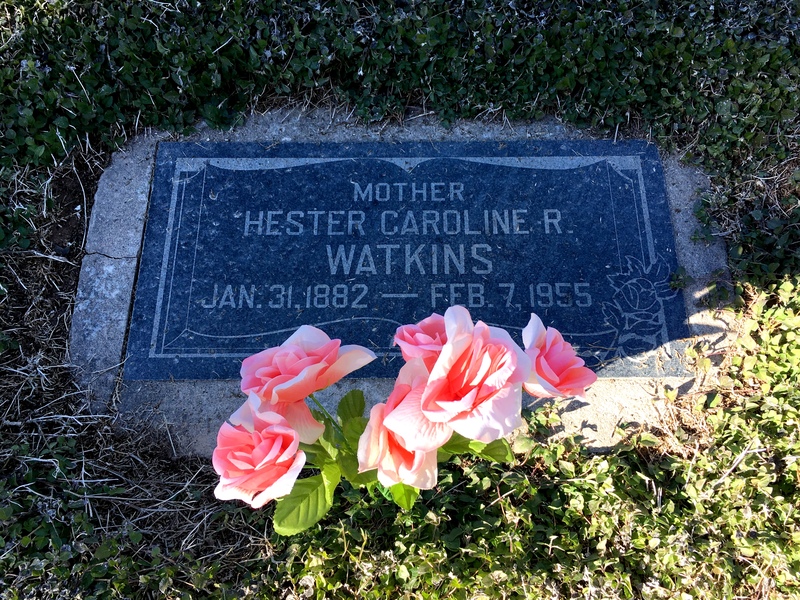 And this week, on her birthday, Grandma wanted to go visit the resting places of those people she still holds so dear. So I dropped off the little ones at school and preschool and we headed for the cemetery. 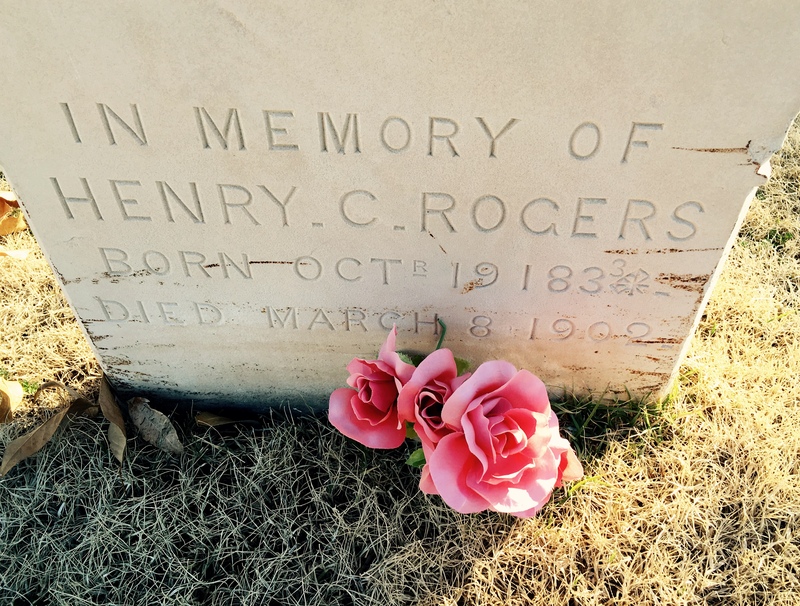 First we visited her grandparents, Emma Higbee and Henry Clay Rogers. Emma and Henry married in Provo, Utah, in 1856, two weeks before Emma’s 20th birthday. They had nine children while living in Utah, and then after 20 years of marriage they were asked by Brigham Young to bring their family south and create a new settlement in Arizona. They came to Lehi, Arizona (now part of Mesa) in 1878, helped build a new community, and made a home. Their last two children were born in Arizona. 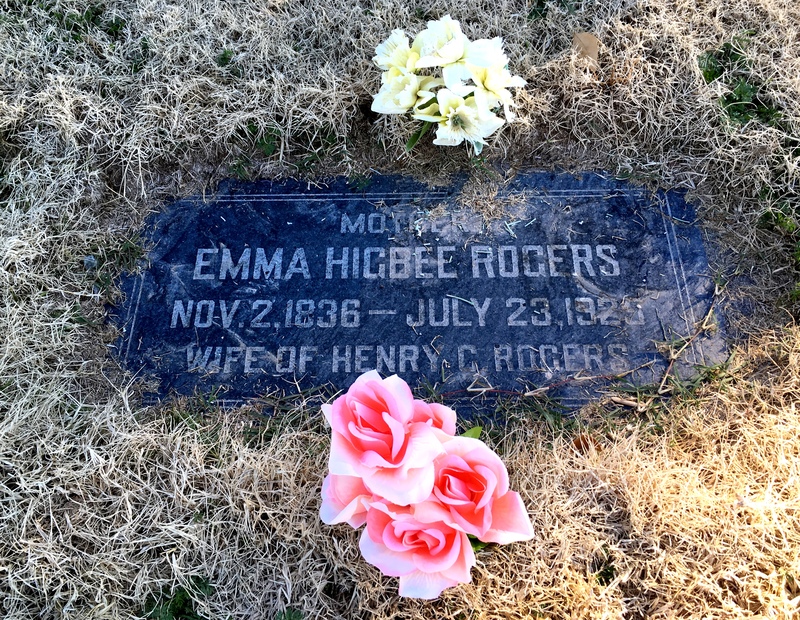 Henry and Emma’s last child was a little girl, Hester Caroline “Caddie” Rogers. She grew up in their desert community near the Salt River, east of the little town of Phoenix. She helped her mother in the house during the week and went to church on Sunday. She watched her father build their little town with the help of the local Indians, whom he often invited into their home for meals and gospel discussions. The garden was small but somehow Mother and Caddie were always able to scrape together a good enough supper for whoever gathered around their table. 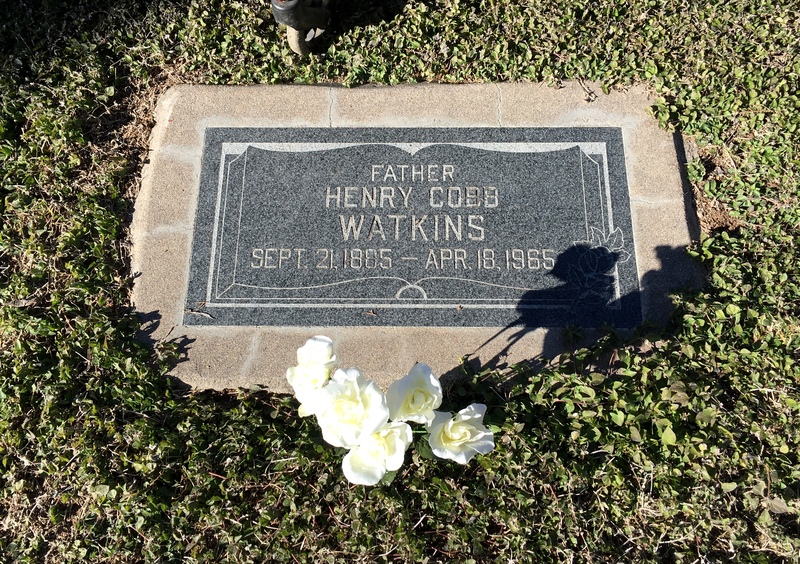 In her teenage years Caddie met a boy from Mesa, Henry “Cobb” Watkins, whom she later married. Intent on marrying in a Mormon temple, they traveled with two other couples on their own version of the “Honeymoon Trail” from Mesa to Los Angeles, where they caught a train to Salt Lake City. They married in the Salt Lake Temple in 1905, when Caddie was 23 years old. They returned to Mesa and started their own family. Like her Mother before her, Caddie had 11 children. She was born in Arizona, but the family left seeking work in California when she was only six months old. They traveled through California following Henry’s employment opportunities, as he fixed the fruit sorting machines behind the seasonal workers. After two years of this sort of work, Caddie insisted they settle somewhere so her children could get a proper education. On their way back to Arizona they stopped to visit an ailing family member in Blanding, Utah, and were talked into settling there for a while. My Grandma spent most of her childhood in Blanding before returning to Mesa and graduating from Mesa High School. After finishing her education in 1943, she went to work at the Air Force base outside of town, where she met a handsome young cowboy and stole his heart. He never remembered how many times he asked her to marry him before she finally said yes — but one day she did, and now here we are. This little one has seen 91 years on this earth, 63 years of marriage, three children, eight grandchildren, and 19 great-grandchildren (so far). She has sent seven of us on missions around the world and seen six graduate college (so far). She has visited all 50 states and most of the Canadian provinces. She has shown us an enduring example of faith and patience and kindness, and we love her. We all just love her. So, #HappyBirthdayGrandma. Thanks for sharing it with us. Today we had five priorities when we walked out of the hotel: Chocolate shop, Indianapolis Temple, Trader Joe’s, playtime at a park, covered bridge. I looked on coveredbridgemap for a covered bridge nearby and found one not too far from the area we were heading to, near the Indy suburbs of Fishers and Carmel. We headed up that way only to discover that the bridge we were looking for was in the fantastic Conner Prairie Interactive History Park. Nothing says Indiana like a covered bridge. We pulled in just as the field trip buses were loading up to take the fieldtrippers back to school, so by the time we got in we had the place nearly to ourselvecs. Inside there was a lovely imaginary play area with forts and art stations and reading areas, and RoRo’s favorite, a playhouse. This child is never happier than when she is hosting a tea party. 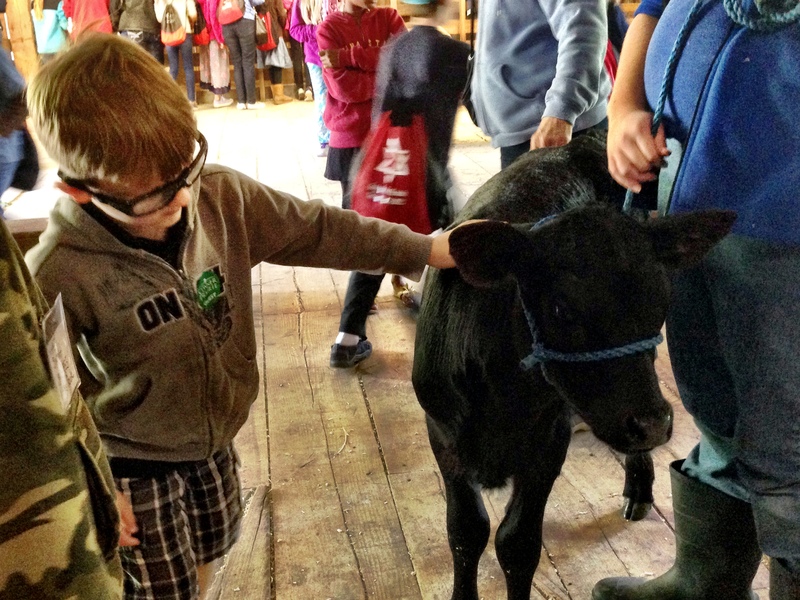 Once we ventured outside, the kids played with a week-old lamb and petted a calf in the barns as we explored the grounds. We crossed the covered bridge to “Dupont, Indiana,” which depicts the Confederate Morgan’s Raid that came into the Indiana and the North from Kentucky in 1863. They had a fun little indoor playground where the kids dressed in period costumes and put each other in jail for various crimes. This little Miss Pickle was delighted to finally be able to model the fashions of the day after spending the previous two days in her bonnet from St. Louis. Then, my favorite, we wandered into Prairietown, an 1836 frontier Indiana town. Emma Higbee was born in 1836 (though on the frontier of western Missouri), so the kids got to see a town representing her era. They explored a general store and a small schoolhouse, spoke with some townspeople and helped sweep and cleanup a prairie home. A possum alseep in a little house on the prairie. Too soon it was 5pm and time to leave Conner Prairie — but again, thanks to Daylight Savings, we still had hours of daylight to burn. We took toys and picnics to a nearby park where the kids made immediate friends with a bunch of Indianans. They played and swung and cartwheeled and slid and climbed and somersaulted, explored in the woods and hid in the prairie, and barely had time to eat a peanut butter sandwich. Hours later as the sun began to set, we left the park in Fishers and headed to Carmel, Indiana, where the Indianapolis Temple is almost finished. The open house will be held in just a few weeks, but even though they’re just finishing up construction we still wanted to go over and see it. I love the way the new temples are incorporating local culture into their architecture, and the Indy temple was no exception. When I first saw renderings of the temple it kind of reminded me of the Phoenix Temple — long and low with a single spire. But when we drove up on it the spire was much more substantial than it had looked in drawings, and it called to my mind monuments we had seen when we’d arrived in Indianapolis. The Indianapolis World War Memorial and the Soldier’s and Sailors’ Monument are beautiful, iconic structures, and the temple spire draws inspiration from these two local institutions. After taking some photos and loving the temple, it was finally time for the sun to set and for us to get ourselves to bed. 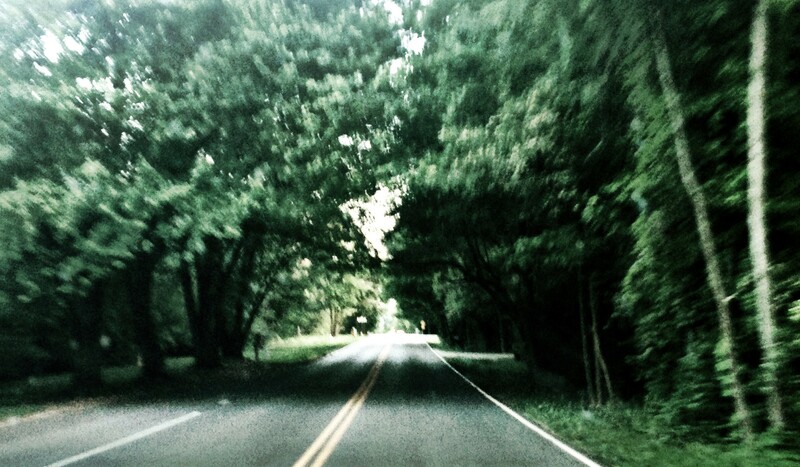 We drove through a tunnel of trees on our way back south into the city, and the kids were amazed at the greenery. We had a great time exploring Indianapolis, but tomorrow we will pack up the car and begin the #PioneerGirl and Emma Higbee days of our trip. We are so excited! Welcome to BeAPioneerGirl.com, the online home of the Pioneer Girls books and our Pioneer Girl community. 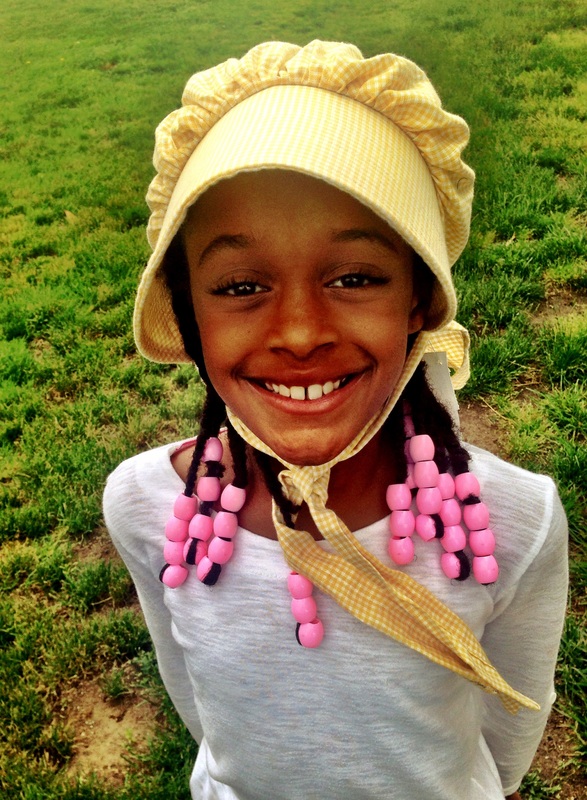 We hope to use this site to share great stories that will inspire you to be a Pioneer Girl in your own way, in your own home, community, ward, country, or even the world. We also want to hear from you! 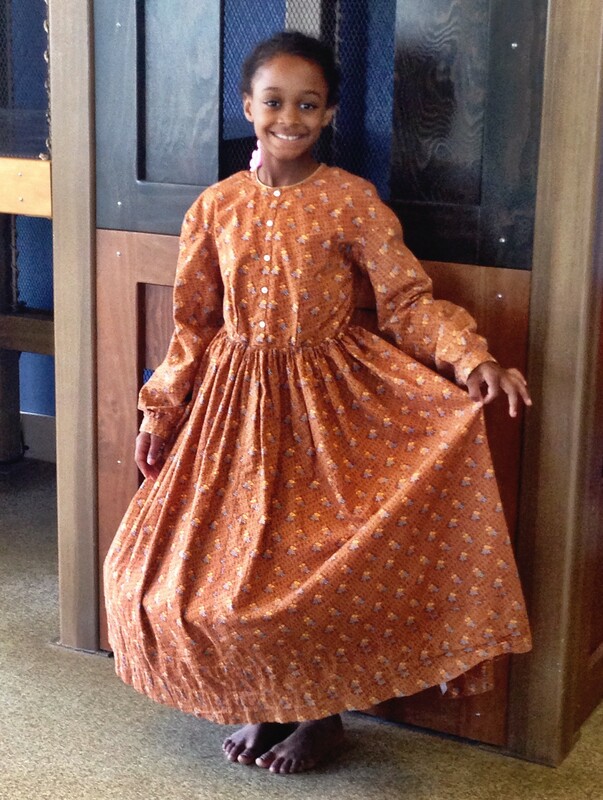 If you know a Pioneer Girl who is making a difference, please send us her story. We want to feature stories of girls who change the world, for themselves or for everyone. You can submit a written story to be published here, or tell us about someone who has made a difference to you and we’ll help write the story. Send us links to articles or books that you’ve read that you think other girls can learn from. Tell us stories of strong girls and women from your own family history. Help us #ShareGoodness and connect with other girls around the world. Thank you for becoming a part of our community today. We hope you’ll come back often and share your stories and experiences with us. Pioneers pave the way – how will you be a Pioneer today?